The sundial is aligned North using a magnetic compass. Click on picture to get the card pattern. 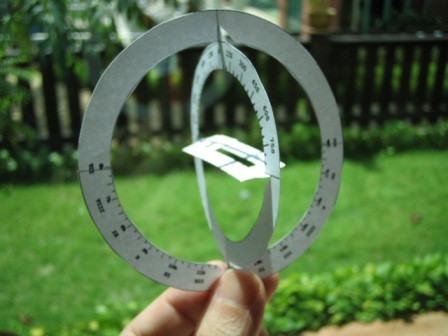 I never did understand the science that went behind designing sundials and could never get one to work properly. That is until I came across a program in www.shadowspro.com. 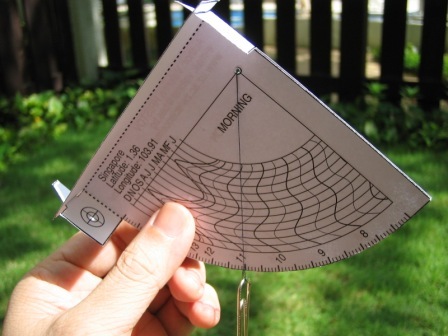 It's a wonderful program that allows you to enter the latitude/longitude of your location, and it prints out a working sundial and a gnomon go along with it. Even with crude construction, it tells time reasonably well. There's a shadow animator that shows how the shadow would move throughout the day and how a shadow at a fixed time behaves over the months. 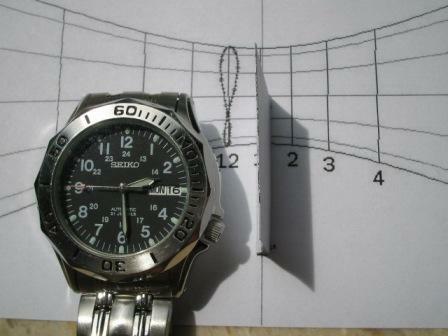 The latter traces a figure 8 shape like that shown on the right diagram above the 12 hour mark. Initially my sundial was always 1 hour slower than local time. After finding out more, I realised that I didn't ask the program to compensate for longitude corrections. Unlike solar time where the Sun rises approximately at 6am, the Sun rises at about 7am in Singapore and sets at 7pm. Thus high noon here is 1pm. Looking at the analemma (figure-8) and the shadow, can you guess the month when the above photographs were taken? 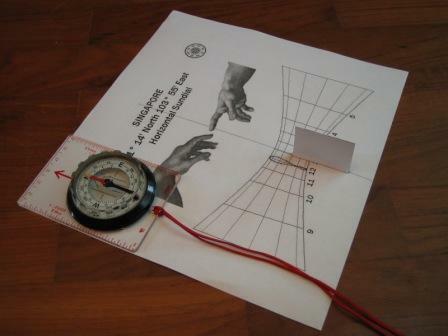 Check out another sundial generation program at http://web.utanet.at/sondereh/sun.htm. It has plans for a shepherd's dial, umbrella dial, horizontal altitude dial (which looks just like a box), etc. 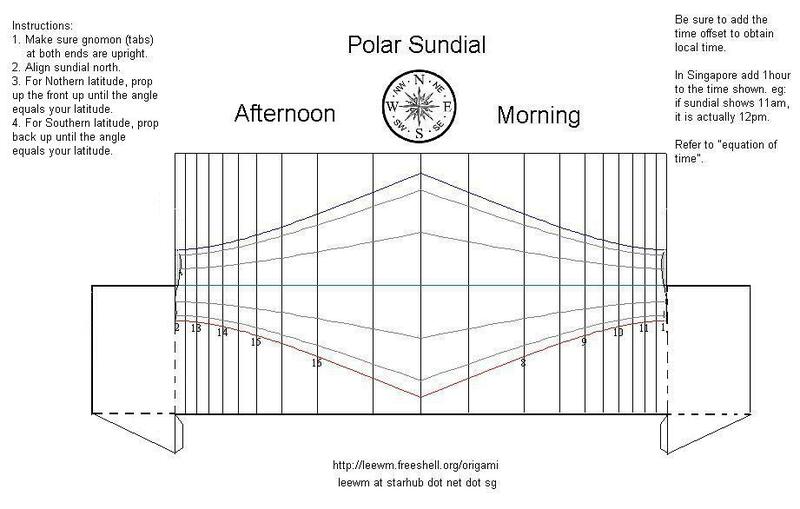 Here's a card pattern for a Polar sundial. It's a jpg file so you can decorate it using MS Paint. It was derived from Shadows Pro with simplified construction to make it easier to build with card. Your end result would be slightly different from the card design as I was experimenting with how best to hold up the gnomon vertically. Theoretically, it can be used in any latitude. Just tilt it up according to your latitude. With an Equation of Time correction table accuracy is increased but I've not tried it outside of Singapore. Let me know if it works for you. A photograph of your polar sundial would be nice. Valentin Hristov has kindly configured one of his polar sundial designs with Equation of Time corrections for use in Singapore here. What's unique about it is the wavy hour lines when the EoT corrections were included. Comparing the wavy hour lines at the latitude of his location in Bulgaria with Singapore, there were slight differences in the patterns. But it was very small. It requires a little more work in the construction but it is well worth the effort. 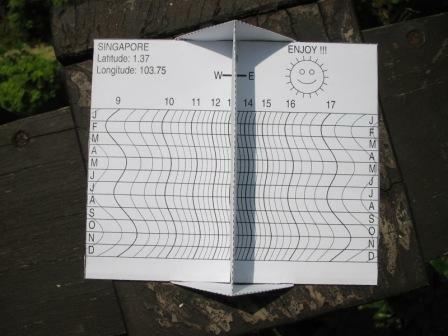 Here's another unusual sundial by Valentin Hristov PostScript program to produce a quadrant sundial for Singapore. The picture was taken on 27 May 05 at about 10:45am when the Sun came out and I was taking a break. You can see that the time was spot on! While mulling about how this device worked, I realised that it can be used to predict the approximate time the Sun was going to clear obstructions. I did a test by predicting when the Sun would strike my grass patch and true enough when the time came, there was the Sun! Maybe such knowledge would be useful to decide where to locate a cactus plant so that it would receive as much sunshine as possible or the best place to hang your wet clothes. I'm sure Feng Shui proponents, architects and city planners would find such information useful. It's hard to imagine that all these made available from a piece of card, some string, paperclips and Valentin's immense thinking that went behind it. The beauty of mathematics! I had a lot of fun (and frustrations) designing the structure of this sundial in my minds eye. Putting on the markings was a different story as I was new to sundial designs. I had to do quite a fair bit of reading up and thanks to the friendly people on the sundial forum who answered my questions. To use it, position the sliding mask on the gnomon (centre piece) to the current month/date. Position your finger/thread under the inner ring according to your latutide and balance the sundial. Rotate the ring until a ray of Sun from the hole in the mask hits the hour ring. These slide rules sure makes a handy wallet size or book mark calculator for doing currency exchange, car fuel consumption, etc, computations. To view PostScript files on your laptop/PC, I used Ghost Script. Instructions on how to use these wonderful devices can be found by googling "slide rules". There're too many to list here. Andy Kinsman original slide rule. I'm amazed at what he did using just the Postscript printer language! 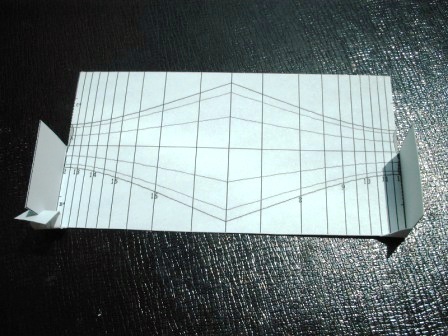 My modification of Andy Kinsman slide rule for easier construction using just scissors and folding. Here's another slide rule design that's the size of a business card. 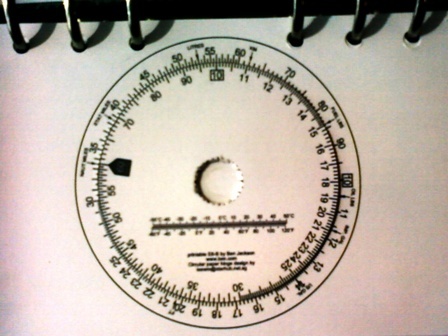 This is a modification of Ben Jackson's E6B circular slide rule with my paper hinge design to allow the 2 discs to rotate. Another variation of the circular slide rule to allow for the computation of timezones. Make a Slide Ruler for transposing chords and building chords here. I got my inspiration from this picture found on Chris Gilling's slide rule site. Mike Williams showed me the secret of the "Blues" sound with his slide rule that was based on the Chord transposing slide rule. My daughter needed a wallet to put her play money in and I remember that there was an origami wallet design on the Internet ... somewhere. But I couldn't find it, so I decided to create one using a sheet of A4 paper. I doubt if it would be able to last very long if made with ordinary paper but there's a very strong paper-like tear proof material called Tyvek that's made by DuPont. I've not been able to buy sheets of it and have only encountered the material on 5.25" floppy covers. 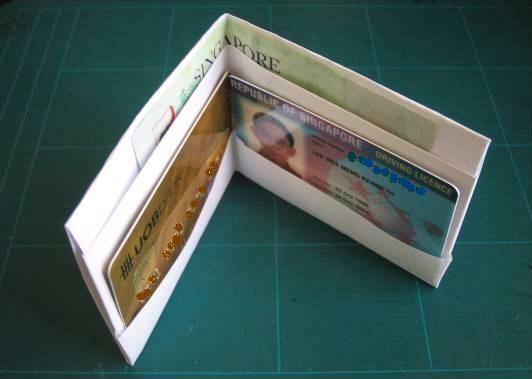 A little bit of rubber cement / contact glue that adheres to Polyethylene, applied to the edges of the fold created in instruction step 6 would hold everything nicely together. Now a wallet made out of Tyvek should be able to last a long time. I've always wished I could find a simple way to draw step by step diagrams of the origami models that I've learnt by rote. Unfortunately I'm not very good at drawing. So what I did was to use a digital camera and MS Word to produce something like this stealth glider. 1. As I made each fold, I took a photograph of it. 2. These photographs are imported into MS Word and I used the drawing tools to trace over the lines. 3. Once all the creases are traced, the photograph is deleted from beneath it leaving the line diagrams. 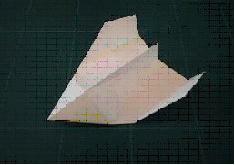 It is very time consuming to diagram a model but once done, u'll never fear that u'll forget the fold. PS: If anyone manages to boost this glider up in a model rocket and successfully gets it to glide down, please share with me your experience. Be sure to check out Jon's website. He has lots of cool paper models of sci-fi space ships there!